Today I had to do that dirty four letter word, work, it is almost as bad as SNOW,COLD,RAIN,or a few others I won't mention. Last night when we pulled in at the rig we had a nice big package waiting on us. It was the new "half time" microwave we had ordered. Since our old microwave required a very lucky hand running across the key pad to make it work we upgraded to a convection/half time/ microwave. Today I installed it, and that really turned out to be WORK, because like everything else when you upgrade it doesn't fit the old hole. I had to build a frame to encase the new one, and then screw it to the existing cabinet, cut down the trim to get it to where I don't worry about it falling out while we are driving down the road. I think it turned out pretty good for a quick install job, and Marcia is happy with it so all is well. Tonight Jim and Kris are taking all the Hosts and work campers out for dinner. I'm not sure where we are going, but I know Jim and Kris well enough to know the food will be good. 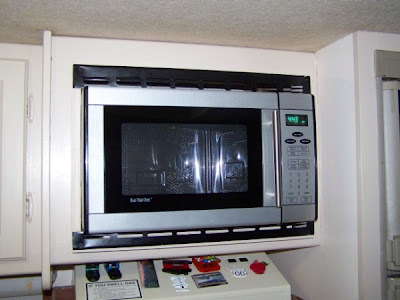 Maybe tomorrow Marcia will try out the new half time microwave?